The fact that food can have a powerful therapeutic effect was already discovered by Hippocrates, the “Father of Medicine”. He was already familiar with the beneficial health effects of fruits and vegetables. It is clear that we have to move away from “empty” food, toward high quality nourishment. The countless beneficial properties of fresh fruit, vegetables, herbs, grasses, algae, nuts, legumes and spices could transform a supermarket directly into a pharmacy. Vitamins, enzymes and trace elements nourish our cells and provide additional energy to our system, which our body can use for self-healing and regeneration. In case there still a deficit in terms of vital substances – which can occur for various reasons – then it is necessary to identify these substances and to provide high quality supplements. 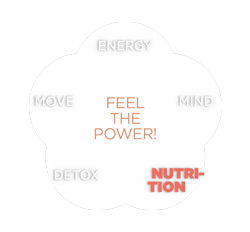 Adapted to your individual needs, the nutrition concept of Beck & Beck gives your body more energy, promotes regeneration and healing as well as detoxification via the intestines. Lay the foundation for new vitality!